We’ve been away from wifi (and electricity) for a couple of days, but we’re back in Mbabane/Emafini tonight. All I can say is “Wow!” after our evening debrief. Our experiences over the last couple of days have ignited such an incredible passion for the spiritual & physical well-being of the people we’ve met along the way. So, this may come as a really long post (or 2-3 separate posts) because all on the team have been writing their thoughts and prayers to share. We rolled up to Section 19 in the khombi (van), right smack dab in the middle of sugar cane fields. There was the playground equipment and the eating and cooking area we’ve been accustomed to seeing, but the community was literally in the care point’s back yard….rows of one room apartments (I assume by the size of them from the outside) then the typical homesteads we’ve seen with individual rooms made from tin, mud and sticks, but two things knocked us down there. The first was the children. They were young. They were filthy dirty. Some had birth defects and deformities. Many of them did not even have pants on and none of them had underwear. None had shoes. Did I mention they were young? There was a child probably 1 year of age, outside, by herself, no parent in sight, crying. There was another probably about 3 years of age that passed out asleep in Stephen’s arms within minutes and was probably the softest thing he had ever slept on, considering they sleep on the ground inside their huts. The kids smelled of urine and dirt and probably slept in their own excrement because diapers were a luxury too expensive to purchase. Not only that, they were miles away from any store with no transportation except their own two feet. Yet, these children literally lit up our hearts and made us feel in conflict with our own emotions of sadness and anger. 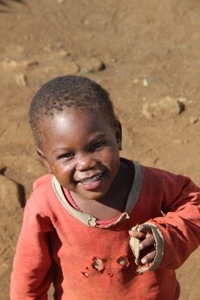 Most of them were full of love, joy and laughter, and when we looked into their eyes we saw Christ. Section 19 is exactly where Christ would be if he were still walking this earth as human. And we were triumphant and hopeful, but saddened and angered all at the same time. Conflicted. The second situation that knocked us off our feet was the story of Nomvula. 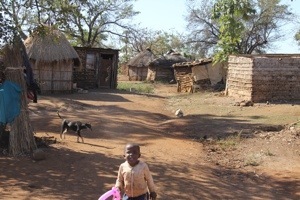 She lived in the community in a hut and she was very sick. She was HIV positive and had tuberculosis. She was 29. Let that sink in. 29 years of age with a death sentence. She has a 9 year old daughter, probably also infected, whom we were unable to meet because she was living elsewhere due to her mother’s incapability to care for her. Nomvula slept on the floor, on a dirty pad with skinny kittens and puppies running around. We prayed for her as a team. We lifted her up to God asking for healing and strength so that she will be able to care for her child and will be used for God’s glory. Wow. I mean you hear statistics. You know people that people are impoverished, you know they are sick, but this home visit brought a whole new perspective because it moved from being a statistic to having a face, a name, a story. I didn’t want to leave. 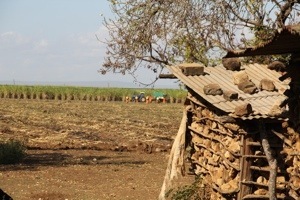 I wanted to run into the sugar cane and hide, so that I could be there everyday to care and love these kids. I wanted nothing more than to give them all a bath and new cloths, but we were unprepared. Like I said, words are merely words until you witness it for yourself. But in all our conflict and emotion, those children gave us love and shared Christ with us, and I pray that our visit and the love that we shared will make a lasting impression on these kids and that it will be something for them to cling to knowing that God is there and He loves them. You are far bigger than the devastating poverty that we have witnessed in the past 10 days. I cling to you as I remind myself that your promises are true. We realize Lord, that some situations require us to cling even tighter to you. Today, you placed our team exactly where you wanted us to be. Section 19 – a place in the most desperate poverty that we have ever witnessed. Families without running water. “Home” is a mud hut with a tin roof. The sight of children who lacked the very basics in care was overwhelming. No words. Heartbroken. Father, would you help us? Show us how we can continue to make an impact on this small community. Keep your hand over them. During the home visit, you placed us with a 29-year-old woman who is so ill she could not get out of her bed. Her body is failing because of HIV and Tuberculosis. Father, the one you love is sick. We pray in the Holy Name of Jesus for healing for our sister in Christ. Please use her as a vessel of your love, mercy and grace. You are The Great Physician. We will pray. Thank you for being the hands and feet of JESUS. Thank you for expressing as best you can the conditions there. You are right, we have no idea we are sure. “Conflicted” is a great word to describe what you experienced at Section 19. Jesus – and His people – really are their only hope.